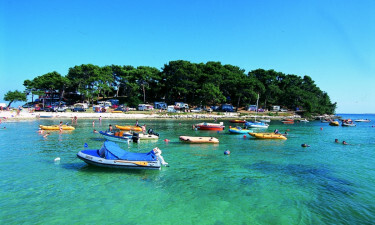 Surrounded by towering pine trees, Camping Meduiln is at the doorstep of a beautiful sandy beach. This luxury camping site is also a picturesque home away from home for lovers of water sports and the outdoors thanks to its natural backdrop and proximity to the turquoise waters of the Mediterranean. 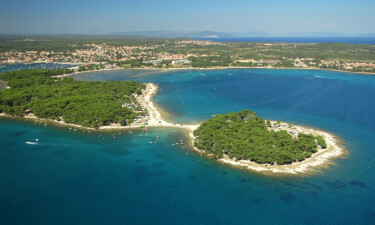 Situated on a gorgeous peninsula that hugs the Uvala Bay, this unique camping holiday site is in the popular resort town of Medulin. The beautiful campground is set among ancient pine trees and offers stunning views of the sea and nearby islands. Book your stay at this unforgettable destination today with LuxCamp! Camping Medulin has everything you need for a comfortable holiday. Along with a great collection of eateries, this luxury camping destination has a supermarket and shop with essentials for your stay. There is a laundry service at the campground, where you can also book a soothing massage. Camping Medulin’s long sandy beach overlooks the clear waters of Uvala Bay. A short walk from your tent or mobile home are lively restaurants and bars with relaxing views of the sea along the beach. A tourist train runs through the campground and along the beach during the summer. Great sports facilities mean you can stay active. There is a massive waterslide and a children’s playground, plus table tennis and bicycle rentals. You can rent equipment from a water sports centre or book surfing lessons at the surf centre. This lovely campground also has scenic trails to bike, jog or walk. There are fun activities for all ages, from treasuring hunts and shows to sports classes and tournaments.